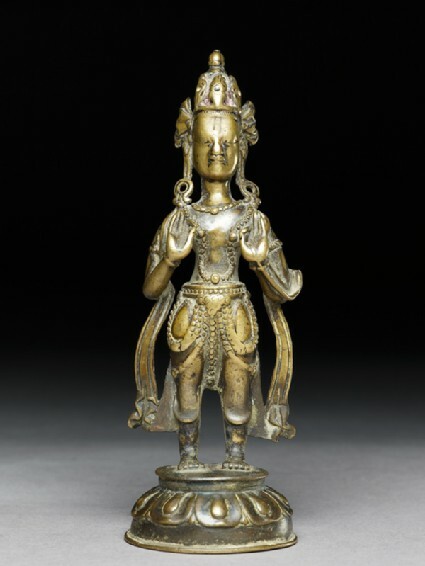 The identification of this Bodhisattva is uncertain. The two hands are now in the vitarka mudra of argumentation, but as a lotus stem is visible in the proper left hand, extending to the elbow, this shows that there was formerly at least one lotus plant supporting an attribute above the left shoulder, in fact perhaps above both shoulders, in view of the symmetrical position of the hands. The very high chignon of piled hair, prominent jewel finial, and distinctive elaboration of the cloth bands of the tiara folded into fan-shaped pleats are all characteristic of the western Himalayan artistic milieu c. 1000 ad, as are the triad of bead pendants on the chest necklace and the beaded chains below the belt . The elongated head, narrow body proportions, and frontal position of the legs also are found in other western Himalayan sculptures, notably a statue found by Tucci in Khojarnath . The very narrow, stiff scarves, with a wide splay of pleats at knee level, frequently appear in the deft modelling of the Kashmiri schools in western Tibet . At the back, the head is fully finished: the two fans of the crown are connected by a band, as if tied together by a knotted string . The tiny waist is emphasized by the beading of the belt. The legs show no garment decoration. The muscular buttocks and thighs are modelled as if the dhoti were clinging tightly, while the edges of the dhoti and the edges of the scarf are merely in silhouette. Four small rectangular elements, measuring 1 x 2 mm high, are positioned at the centre of the dhoti ovals, at the level of the heart, and in the centre of the forehead. Possibly these small rectangles at heart and forehead would relate to chakras of the body, but those on the dhoti appear to be purely decorative. 1 Pal, Desire and Devotion, pls. 164 and 167, described by Hiram Woodward. 2 Tucci, Transhimalaya, pl. 147; though this sculpture has more athletic pectoral muscles. 3 von Schroeder, Buddhist Sculptures in Tibet, vol. 1, pls. 44A-D.
4 Ibid., vol. 2, pls. 298 B-C, for a similar band of the tiara ribbons at the back of the head.